How do you to talk about the really hard stuff with partners, friends or co-workers? 1. Timidly avoid these kinds of conversations. 2. Show up fully armored or skeptical, anticipating a painful experience. 3. Go into battle with axes swinging and suffer from the mutual fallout in the aftermath. Unfortunately, none of these behaviors work, yet we keep trying them without a better alternative! We suggest having a courageous conversation, which usually leads to more vitality, freedom and a renewed collaboration. 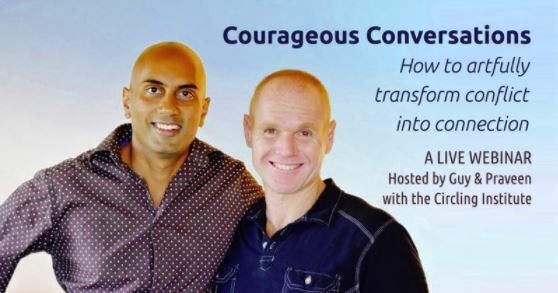 Join Guy Sengstock and Praveen Mantena from the Circling Institute as we show you how to take your next challenging, uncomfortable or potentially volatile conversation and turn it into an opportunity for successfully resolving conflict. One that ideally builds more connection and has the other party becoming your ally. This is something most of were not taught how to do well, can’t figure out on our own, or don’t even believe is possible in such situations. 1. Start these conversations and what NOT to do. 2. Turn your fears and vulnerabilities into your greatest asset. 3. Fearlessly speak your truth, especially when you are uncomfortable or upset. 4. Come out with both parties feeling fully seen and heard. 5. Create better agreements and mutual support for what is next. We dive in, demo some of the most challenging scenarios and do laser coaching with the participants on the stickiest aspects of having a courageous conversation.